What, no entries yet? No inspiration? OK, then, at the risk of seeming presumptuous, allow me to offer some suggestions, if I may. 1. Pot of gold at the end of the universe? 2. The United Federation of Irish? 3. St. Patrick's Day on the Red Planet? 1. Lord of the Leprechauns? 3. Vicky in a temple with a shilleliegh? 4. The Lion, the Leprechaun and the Wardrobe? C'mon, lets see some renders, folks! Thanks for the inspirational titles SixDs!! I know there have to be some ideas for this, St Patty's day is two days away. i've been informed by my 23 year old daughter that its one of the best party nights of the year lol (Cause I was never young and don't know this stuff apparently). And guess who gets to be the designated driver for this party night? And here was me hoping someone would actually try it. Oh, I have some DAZ castles or two that would be OK. Since the Blarney Stone is year round I I will try that after St Patrick's Day for entry number two. I have a Blarney Stone rock I bought visiting presuming Ireland that the leaflet included claimed was mined from the same place the stone was mined to build that castle and the Blarney Stone. Seriously though, I agree with Nonesuch00: a scene involving the actual Blarney Stone at Castle Blarney is tricky to set up-both finding suitable assets and suitable camera angles. Not impossible, mind, just difficult. I think I found what I need to make it happen though. Absolutely, Odaa. I won't be entering, so please, if they strike anyone's fancy, have at it! Well what can I say...I had a St Paddy's render running that should of been 16 hours in when I went to go post it this morning and instead find Windows had patched and updated my computer without even a notice beforehand that it was going to do so....so I'll restart the render & post it with online 6 - 8 hours of rendertime this evening. I don't think that you are the one that should be apologizing, nonesuch. That's a bummer. Well reading the contest rules the render I have running now is not allowed anyway because the characters are not kissing or trying to kiss the Blarney Stone. 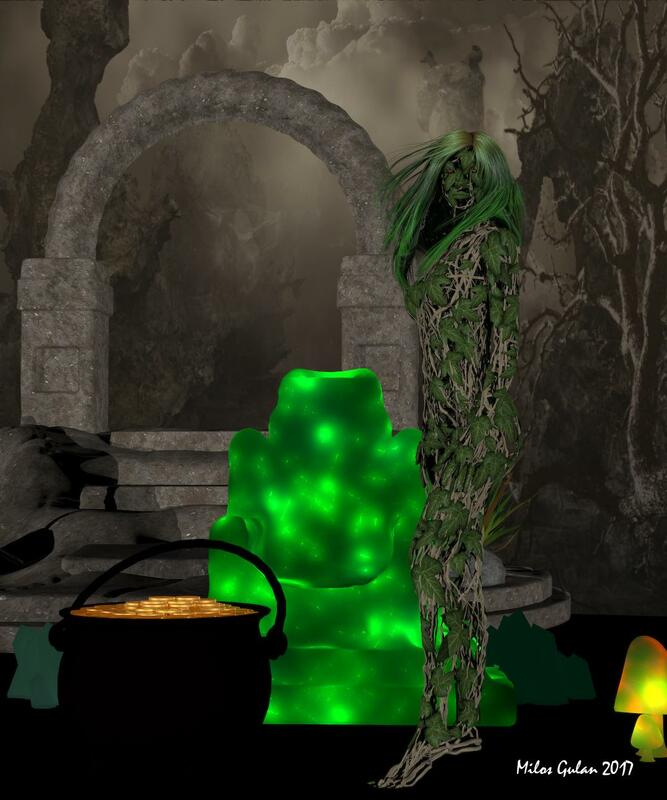 I will post it anyway and will make another render using the same characters and they will be trying to kiss the Blarney Stone as I've an ideal how to correctly 'simulate' that using DAZ products I own already. I tried to make dryad again and this time it worked, only that it is a bit Mysterious, I guess a bit evil... I have loaded that backdrop and rest of the picture followed. I figured out that those leaves on dryad are Ivy and I have just cleaned Oaks in my gardens, and ones that I take care of, of it https://en.wikipedia.org/wiki/Hedera_helix#Damage_to_trees. I think it should be done one in a 2 years, and I have seen a very large oak destroyed by Ivy that I cleaned but he didn't survived as I hoped he will. 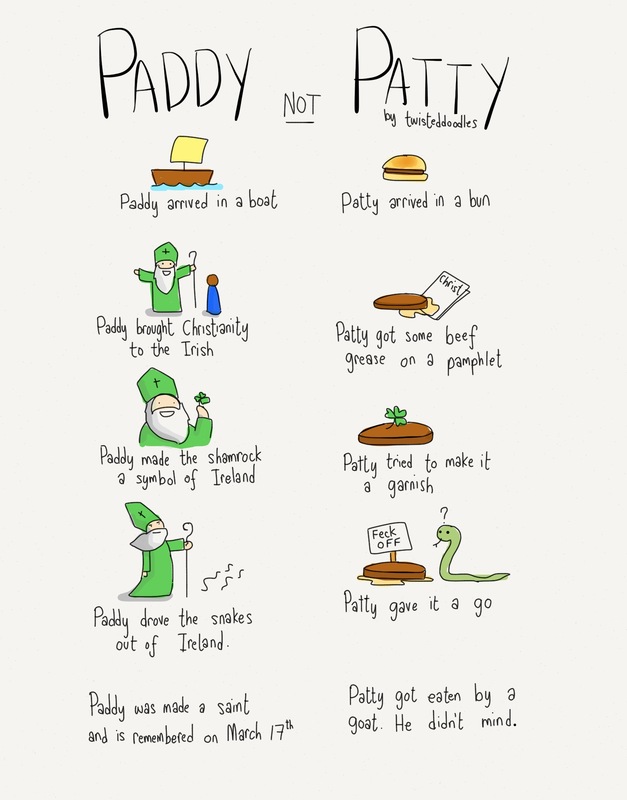 Anyway Happy St. Patricks day. I hoped I will finish this picture yesterday, but electricity went out so I had to do render again, but at least I have watched part of the parade in Dublin, live on my new Samsung cell phone and it seems it is from 16-19 March. Well here is to hoping you do get a render done before the end of the month Nonesuch!!! Here is my entry. 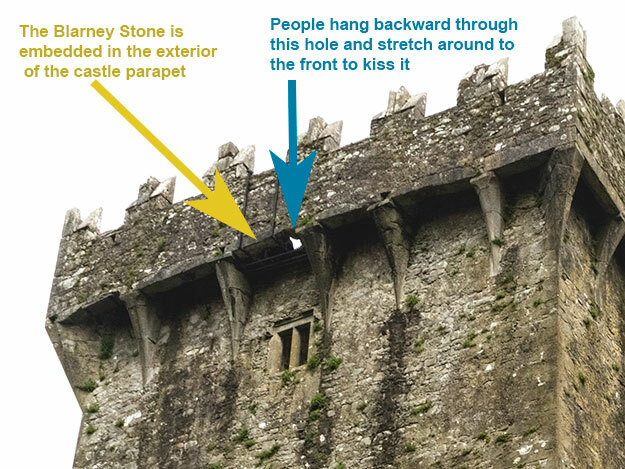 I have a lot of work to do in the next week so I may not get to the render I had planned for the Blarney Stone itself. Hold on....I need to list the freebies used. They are listed in my gallery but not the actual links to them! Doh! I've exceeded the paid limit by 5 items so that disqualifies this entry! Oh well. Here is a link to my gallery for the disqualified entry. It has links to all the DAZ products except FaceGen (I bought it externally Feb 2016) and Oh My Brows which I bought at Rendo last summer. * Pretty 3D Lovely Senses https://www.renderosity.com/mod/freestuff/lovely-senses-free-site-registiration-required-/54645 ; but doesn't seem to work now. Everything checked, the pretty 3d lovely senses worked ok when I looked at them. Please move to entries thread! Oh good, we have now 4 entries. All freebies checked an working, one question though: the Mushroom with the door is in the free backgrounds, and that comes with the trees as well? The promo on Rendo shows only one background, so its hard to say. So, if yes, please move to the entries thread. I had the wrong one linked, I now have the correct link for the Mushroom background. Sorry about that. Oh I just checked too lol. So you are doubley good to go lol. Rendered with 3Delight. Post work done was to add signature. Environment: mushrooms * fennjas mushrooms by Fennja. Environment:Grounds * Vikike's Ground 01 by vikike176. Environment:mushrooms * Fennjas Mushrooms for DAZ Studio 4.8 and up by DollyGirl13. Environment:Pot of Gold * St. Patrick day by dorkatiGHD. Environment:Rocks * Rocks by Yughues aka Nobiax. Environment:Treeandflowers * Forgetmenot by Poisen. G2F:Hair Short Hair Evolution by Kozaburo. G2F:Pose * Beach sport poses by peteg. G2F:Pose * G2M Conversation poses by peteg. G2F:Shoes * G2F Oriental Outfit by wilmap. 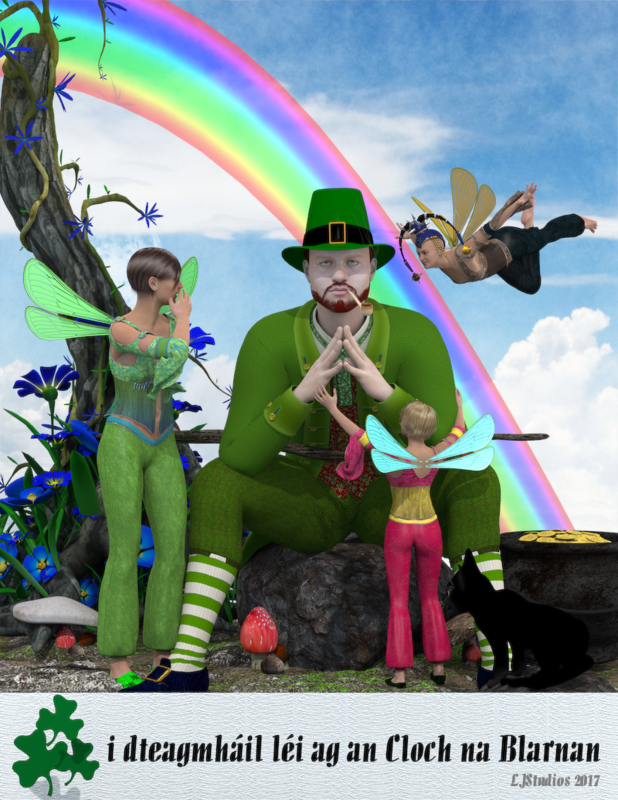 M4:Character Leprechaun M4 by mmalbert redeyecat. M4:Character * 182 Morphs for Victoria 4 182 Morphs for Victoria 4 by DieTrying. M4:Clothing * 18th century suit by Varsel. M4:Hair * Hero hair by iceboy. M4:Staff * Wizard Staff by Christel. Shader: Walking Stick * Iray Nobiax Shaders by kaz42. M4, Genesis 2 Female, Persian Beauty Outfit and Toulouse Hair are all no counts. The following items are no longer available. Sorry to see runtimedna's freebies located in their forums have been lost. Cat: Mesky Mesky & Blackie by Ynaelis3D. G2F:Hat Empress Headdress by Chi Studios. M4:Character M4 - Curtis by Structure. M4:Clothing Morphing St Pat Hat by Deerpath. This is a nice render Seeshell. If you are interested there is a video that will incorporate shadows onto your background and thus make your fairy and shamrocks be more a part of the scene. The video uses DAZ Studio 3 but the steps to make the shadows are the same for Studio 4.